Can YouTube stop putting ads next to ISIS videos? YouTube are suffering some problems currently. Ads from big corporate advertisers are appearing next to content from ISIS and other extremist groups. YouTube and the other internet giants point out that 400 hours of video are uploaded to YouTube every minute. So that it’s almost impossible to find bad content. However this may be the wrong way to look at it. There are really two ways to fix a problem like this. The first way is to whitelist YouTube channels that advertising appears against. For instance you get the most popular 100,000 YouTube channels and put them through a verification process that weeds out inappropriate content. Human tagging, combined with machine learning (in the literal sense), would make this expensive but not impossible. The problem for YouTube is that they’d then have to remove, or change, advertising against all other channels. Back in 2015 there were 837,000 ad supported YouTube channels. It would be reasonable to assume that there are at least twice as many channels today. However the, say, 1.9m channels which would not get verified are 95% of the channels, but likely only, say, 20% of the views. So YouTube would need to give up that ad inventory. Or it could sell it to less squeamish advertisers at a lower rate. Isn’t from a known safe channel or user. Has any tag or keyword that is risky (e.g. ‘Iraq’). Add these together and the number of videos to review drops dramatically. Get your reviewing mechanism to learn from human judgement, and you should, fairly quickly, be able to handle the problem. YouTube/Google have some of the world’s best machine learning experts, huge budgets and good reasons to move quickly. They can fix this. Three laws of technology hype. Technology companies constantly hype their own processes and products. Often this hype is technically truthful, but misleading. But hype takes on a life of its own, misunderstood or exaggerated. Eventually hype leads to absurd claims. These cause real damage. To protect yourself look at three laws of marketing hype. Impossible claims are at the centre of technology hype. Or the hype focuses on things that might be technically possible, but impractical. First consider a Guardian claim about Cambridge Analytica’s work for Donald Trump during the 2016 election. The Guardian: Impossible & nonsense claims about Facebook. The article claims that Cambridge Analytica harvested data from people’s Facebook profiles. Here’s the problem though: This is almost impossible. The vast majority of people’s Facebook data is private. This data can only be seen by their friends or if they choose to reveal it to a company. Facebook has made it increasingly hard for companies to harvest personal data. Barack Obama’s 2008 campaign did harvest vast amounts of people’s data – with their permission. But, even with Obama to motivate people, his campaign only managed to get data for 1 million voters. Subsequently Facebook made it much harder to do even this. Of course you could try and scam your way to people’s data. You could create thousands of fake Facebook profiles. Then try to befriend all 128m American voters. Then copy their data. While this is possible on a small scale, Facebook is generally good at weeding out large scale scams like this. A related example is almost any article that claims that companies know huge amounts about you. Yes, there is a lot of data, but it’s not always meaningful. To test this visit Amazon. Then ask yourself how good their recommendations are. They’re probably ok – but not amazing. Amazon have more data to make recommendations about what to buy than virtually anyone else. Yet they struggle to get it right. To complete your personal test visit Google, Facebook and Apple’s websites. Have a look at how well personalised they are. The vast majority of data is either private, anonymised or just not very useful. If you want a guide to what’s possible then have a look at the world’s best companies at selling data. Simply create an advertising account on Google. Or look at the business sections of Facebook, Amazon, Experian and Axciom. Impracticality is closely linked to impossibility. AI is currently going through a bubble that is often based on impracticality. Read reports on autonomous cars and you’d think every taxi driver in the world was about to lose their job. Then look at Uber’s current testing, which recently leaked, and you’ll find that humans had to take over the driving every 0.8 miles on average. That’s a long way from a technology that is going to satisfy regulators and insurance companies. A final angle on impossibility is the law. Is the technology legal? And does it comply with relevant social network policies? Data protection laws, and discrimination laws, might simply make it illegal. And if a company scrapes millions of people’s data from Facebook they can expect to be sued. New technology might be practical and legal. But it often isn’t worth the effort compared to easier and cheaper approaches. There are lots of simple ways to improve digital campaigns, because they are simple to test. It’s common for testing to increase the effectiveness of a campaign by 10-20%, quickly and at low cost. So the second law is that technology may not be a better use of your time than simpler alternatives. Another way to look at this law is to ask if you have exhausted your current testing programme. Have you got the right strategic choices? Are you using the right channels, for the right purposes? Have you optimised your customer journey, from acquisition to conversion? Is your creative optimised? Most organisations have many areas where they can become more effective without needing cutting-edge technology. For instance digital content programmes can routinely become 20-40% more efficient. I recently reviewed the digital marketing programmes of five of the world’s leading marketing automation providers. If anyone is going to be using cutting edge technology, it’s this group. Yet all of them fail on at least one basic measure. Several have very poor quality email programmes, with virtually no personalisation. Some of them don’t re-market to people who visit their website. Their websites are generic even when they know something about you. Why is this? Some of it is inertia. But it also reflects a judgement that new technology isn’t worth the effort of implementing it. Apply the second law to claims that people can predict the future (e.g. the X-Factor). You could try through social listening but that’s hard to get right. It’s easier, and probably cheaper, to commission a traditional poll. Penetration – What proportion of the target audience encounter your technology? Time use – How long do your audience spend with the technology? The problem with anything new is that not many people use it. By definition. So there needs to be a route for it to penetrate its market. This can sometimes happen organically. But most of the time this needs time and marketing. Apply the third law to VR discussion and something becomes clear. Most VR won’t get to enough people to make a difference. Why? Because there’s no distribution system for it, unless it’s through Google, Apple, Facebook or Amazon. What is the most hyped technology? Look at the three laws and what areas of technology look overhyped currently? Not enough reach, and not much evidence of impact in many cases. AI that’s implied to be fully automated. If you re-cast these claims as ‘software tools making people smarter’ then there are plenty of sensible cases. But implying that you have an artificial intelligence, when you just have programmatic media buying, you’re pulling a con. Almost all discussions of Social media that don’t mention reach. ‘Data science’ that claims to know people better than they know themselves. 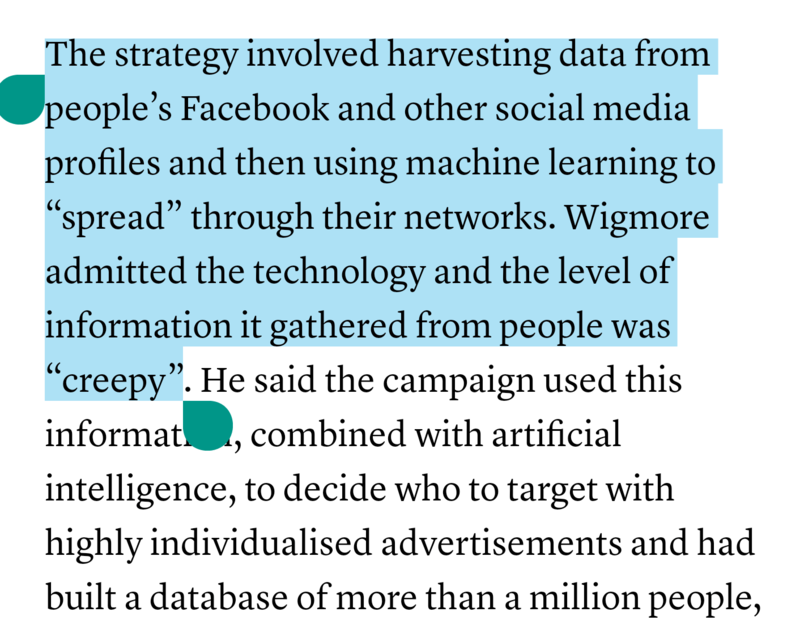 There’s also a claim that Cambridge Analytica used ‘machine learning to “spread” through their networks’. This is a confused claim, that might charitably be read to mean that Cambridge Analytica used machine learning to understand what content was most liable to be shared on social media. Saving 20% of your digital content budget is one of the easiest ways to increase your profit margins. I had drinks with a couple of industry contacts recently. One works in a large, successful, multi-national. The other, like me, has spent the last decade working in-house and at agencies for big companies. We started by discussing all the complex, cutting edge industry stuff. Things like Artificial Intelligence. But we then also agreed that it was pointless for many organisations. Because most of hadn’t fixed the basics first. Savings are readily had almost everywhere. Almost everyone we’ve ever worked with can get an, almost, free lunch. Here are three easy ways to fix the basics, and save up to 20% of your digital marketing costs. Most organisations now pay for a wide range of tools – with overlapping capabilities. Audit them and you’ll usually find unused or under-used licenses. These are all now easy to buy online. So many bits of your organisation will have bought them. Usually without coordination. The simplest way to identify what you are buying is to ask your own finance department for a list of all spending of more than, say, £500. Or just ask everyone to report what they are buying. Most tools are being bought for a reason. But if you look at what they are actually used for, you’ll find that you’ve got the wrong set of tools. Even if the set of tools is exactly right, you can usually secure a significant discount from tool providers every year when you renew your contract. Savings: 1-5% of your costs. This sounds obvious. But most organisations have significant resources devoted to activities with very low impact. Organisations often don’t have consistent reporting on what they are achieving. For instance it’s common to see Social channels which get resources, but virtually no reach. Stop this pointless activity and you have savings at almost zero cost. Here is an analysis of a Twitter account, which took me 10 minutes. This account gets over 4 million impressions per month. Content type A (Pictures, with no caption) gets 3 impressions on average, Content type B (direct replies) gets 1,248 impressions and Content type C (normal tweets) gets 13,354 impressions. Source: Twitter analytics for an account with more than 4m impressions per month. My thanks to the Twitter account user who shared this with me. Type A tweets accounted for 4% of the 380 tweets from this account in one month. 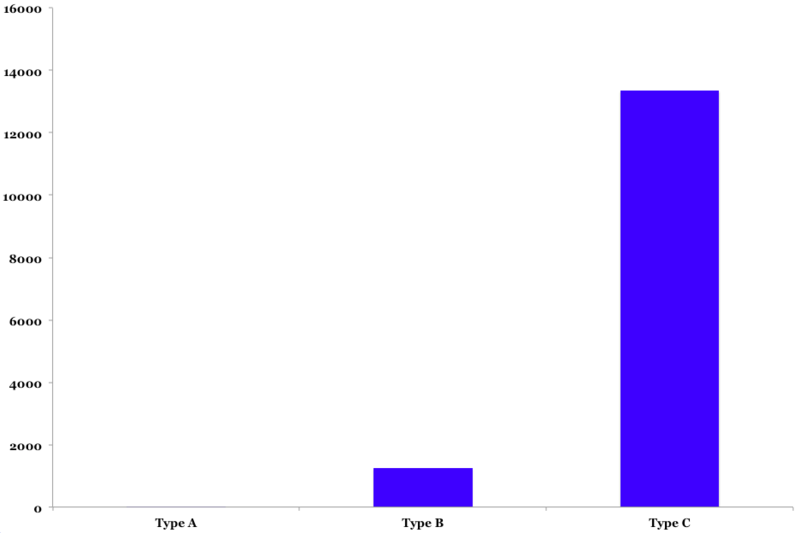 Type B tweets were another 24%. Eliminating type A and cutting type B to necessary replies (maybe half of the total), would save 16% of resources, but only cut reach by 1%. Channels which don’t have any impact – either because of mismatch with your audience’s behaviours or low reach. Types of content which have no impact on your audiences. This is harder to know than it sounds, because a lot of content doing a brand job will have low engagement. Savings: 10-15% of your costs. Modern organisations constantly create marketing content. Yet staff turnover and organisational siloes mean that once created it’s often lost in practice. These problems are even worse when more than one country is involved. This means that content constantly gets re-created. In some organisations I’ve seen up to 40% of content being inappropriately created. In a large organisation this can be millions of pounds a year wasted. Intranets are meant to solve this. But they have almost always failed until recently. New solutions, especially Google Drive and Slack, are now making it easy to share and find content. This isn’t quite a free lunch. While Slack and Google Drive are cheap, they aren’t always free. And there’s some work to ensure that people adopt them, tag documents appropriately and get good habits. There are many other areas you can save on. But to start with, saving on these three areas is a lot easier than using cutting edge technologies. Back in 2013 I was planning for our social team. 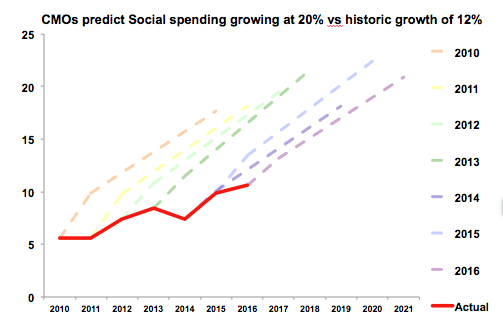 A key bit of this planning was predicting how much chief marketing officers would spend on social. How big was our market? So I turned to the CMO survey. Run by Duke University, it surveys around 400 senior marketers twice a year on a wide range of issues, including how much they spend, and plan to spend, on social. Social media was going to grow 50% in a year, and 157% over the next five years – an average of 21% per year. I came back to this figure recently – after all we’re now three years later – expecting to see them spending 14.9% on social. Instead they’ve spent 10.6% on social. Dramatically lower than they predicted. I decided to dig in a little further – and compare what CMOs have predicted with what they did. CMOs predicted dramatically more medium term spending – consistently around 20% per year growth. CMOs increased actual spending by around 12% per year. 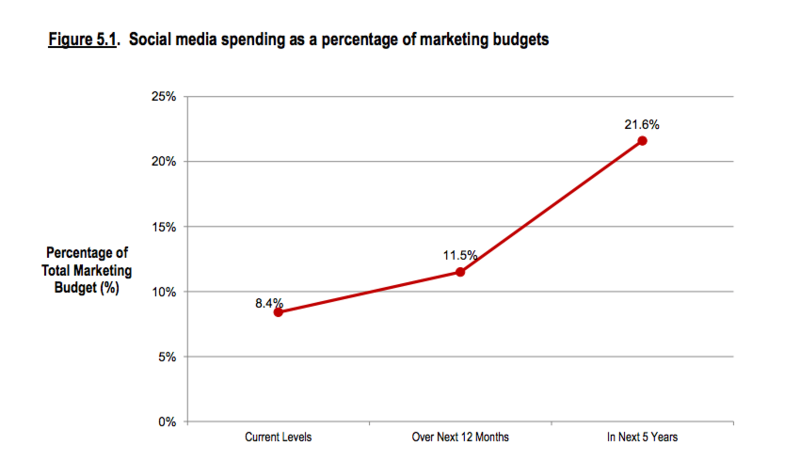 The CMO Survey would note plans to dramatically increase spending on social. This is no disaster. A market growing at 12% a year is still extremely healthy. But it reminds us that even the best intentioned, honest people are fairly bad at predicting their future behaviour. Let alone other people’s behaviours. It’s why I admire my friends James Whatley and Marshall Manson. ​Every year their trends deck starts with them confessing their mistakes from the previous year​. This year it was the prediction that marketing’s obsession with ‘millenials’ would collapse. So as we all plan for 2017, it would be a good discipline for all of us to look back and honestly admit what we got wrong. I’m making a little list. Social media was crucial in getting Donald Trump elected. But it wasn’t predictable from Social listening, despite some over-excited claims.